If you are searching through the bed-in-a-box market, one of the biggest names to come up will undoubtedly be Leesa. 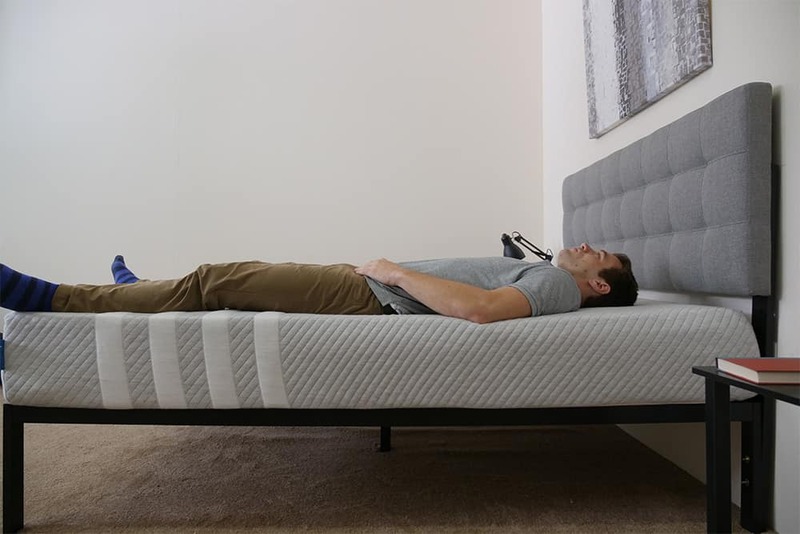 In this review, I take a look at their all-foam mattress option to see who I think might be best served by a night sleeping on a Leesa mattress. Interested in finding out if the Leesa is the right fit for you? Read on to find out! Leesa Coupon: Click here to save $125 on any Leesa! Leesa was one of the pioneers in the online mattress industry, shipping bed-in-a-box mattresses directly to consumers since 2014. The company has grown to offer different types of mattresses as well as a number of sleep products including pillows, blankets and foundations. While Leesa may still be thought of as an online retailer, they can now be found in retail locations such as West Elm and their own Leesa Dream Gallery locations in New York City and Virginia Beach. HOW IS A LEESA MATTRESS CONSTRUCTED? Leesa’s flagship mattress is an all-foam construction standing 10 inches tall. It contains three layers, and judging by the materials used, it should provide a balanced feel of pressure relief and support. Made of a polyester blend, the cover on the Leesa is pretty soft and has a bit of a cozy feel to it. I felt that it was pretty breathable to allow for airflow into the mattress for temperature regulation. It feels a bit thicker than other covers that I have seen, making it a durable piece of fabric. The comfort layer of the Leesa consists of 2 inches of Avena foam, which is known to be a bit like latex. 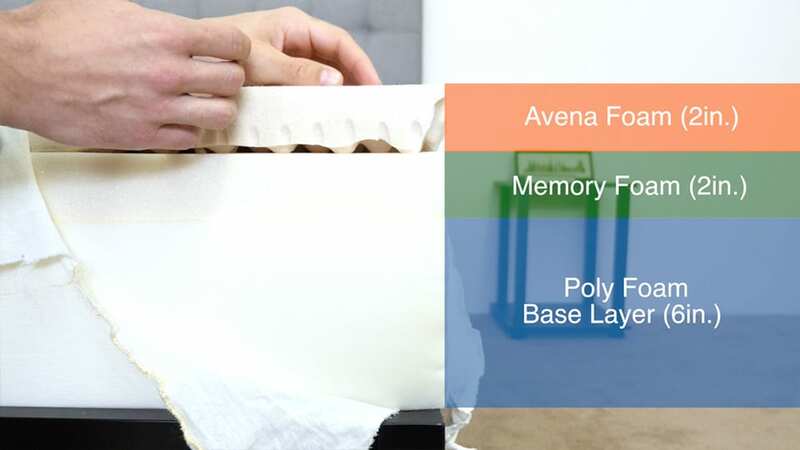 Like latex foam, Avena has a quick response to pressure, providing the mattress with some bounce, so you will be able to change positions without much interference from the mattress. This material also has great cooling properties, and combined with the holes in the top of the layer and convoluted (eggshell) design of the bottom, it should help regulate temperature and keep the sleeper a bit cooler. The middle layer on the Leesa is made of 2 inches of memory foam. Memory foam contours to the body and allows sleepers to sink into the mattress a bit for pressure relief. Memory foam does have a reputation for retaining heat, so by placing the layer below the latex-like Avena foam, Leesa has added a safeguard against overheating. Its location under the more responsive comfort layer also means that sleepers will get the pressure-relieving benefits when they push through to the memory foam but won’t have to worry about feeling stuck. The base of the Leesa is 6 inches of high-density poly foam and supports the comfort layers above as well as the sleeper on top. This layer acts as the foundation of the Leesa, providing the mattress with its shape and giving it some durability as well. When pressing into the mattress, the Avena foam gives a quick response and has a bounce to it. As I pushed further into the layers, I could feel some air coming through the holes in the comfort layer, showing that the cover has good breathability. When I pushed harder, I could feel myself going into the memory foam layer and the mattress contouring to my hand a bit. Everyone feels the firmness of a mattress a bit differently because of different sizes and weight distributions, so instead of just giving my opinion, I brought in three other testers. By giving a broader range of opinions on the firmness level, I hope to give you a better sense of what you can expect when lying on a Leesa. 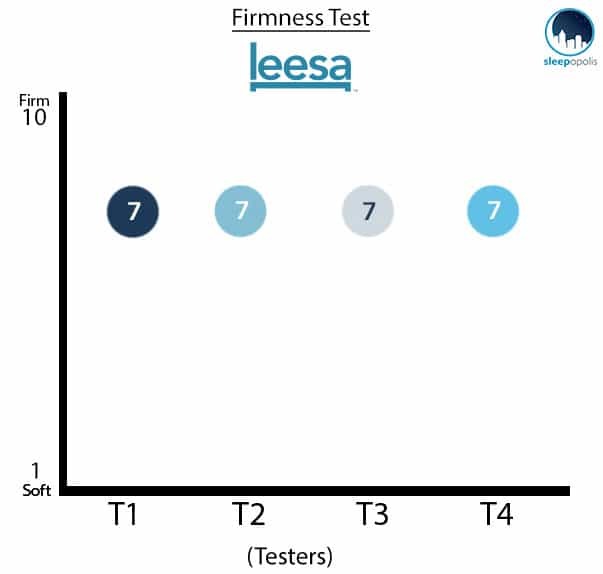 As you can see from the graphic above, all of the testers found the Leesa to be a 7 out of 10 on the firmness scale. This rating puts it in the medium firmness range, with maybe a little hedge toward the firmer side. 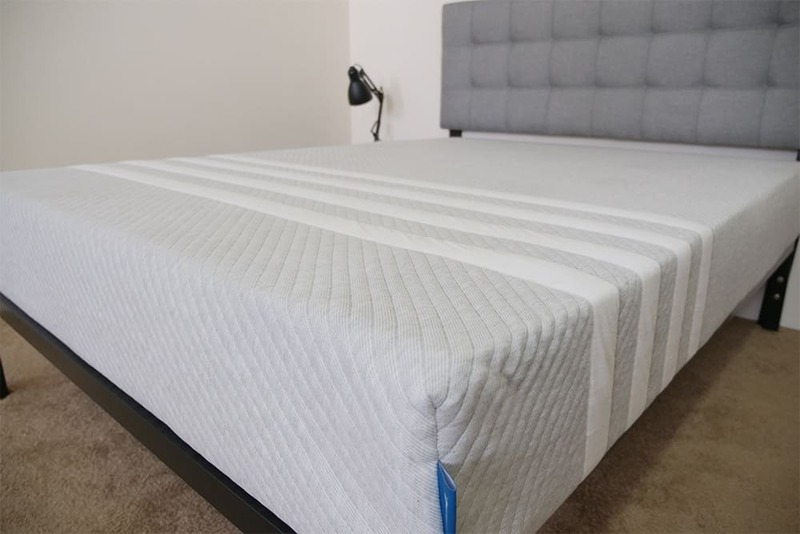 This level of firmness should be a good feeling for most sleepers and will be a good fit for those who sleep in multiple positions or move around a bit during the night. While this is one of the most consistent ratings the testers have put on a mattress, based on differences in body shape and weight, you may still feel the firmness slightly differently. When I first lay down on the mattress, I could feel that there was a good amount of bounce. The quick response of the Avena foam pairs with the medium firmness of the mattress to give more of a feeling of lying on top than sinking into the mattress. I felt well supported and could adjust positions without interference from the mattress. Beyond the initial feel of the top layer, once I pushed through to the memory foam beneath, I was able to feel the pressure-relieving benefits of the material. DOES A LEESA MATTRESS ALLEVIATE PRESSURE POINTS? Pressure relief is one of the most important jobs of any mattress that you purchase. Instead of just describing the feel of the Leesa to you, I wanted to give a visual representation of where pressure points may start to form while lying on the mattress. To do this, I placed a pressure map on top of the Leesa and lay on my back, side, and stomach. On the image below, pressure will be represented from blue (low pressure) to red (high pressure). While on my back, I could feel the foam layers fill in the space beneath my lower back, which is important, as lumbar support is a huge plus for anyone who sleeps on their back. You can see in the image above that the Leesa did a good job of distributing my weight evenly so that there is low pressure across my entire body. I felt that the bounce of the Avena foam allowed me to adjust my sleeping position easily. 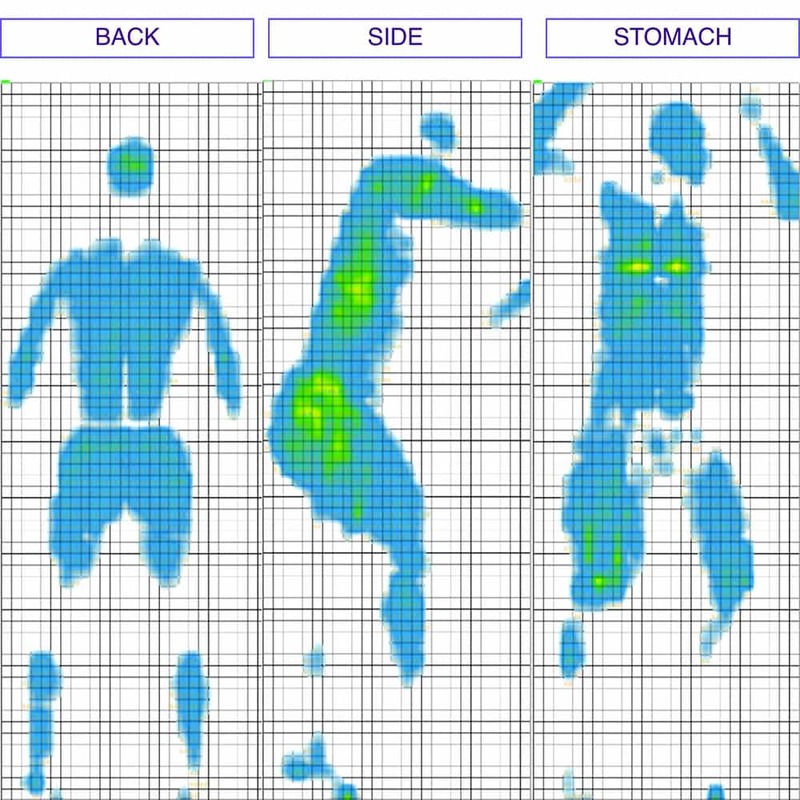 As I lay on my side, I could not feel pressure points form, and that shows up on the pressure map with only a slight increase in pressure thanks to increased weight concentration. The impressive part here is the pressure appears the same along my entire body, even at the shoulders and hip, which are extremely important places for side sleepers to have proper pressure relief. If you plan on sharing your bed with a partner, the ability to isolate motion can be a very important aspect of the mattress. 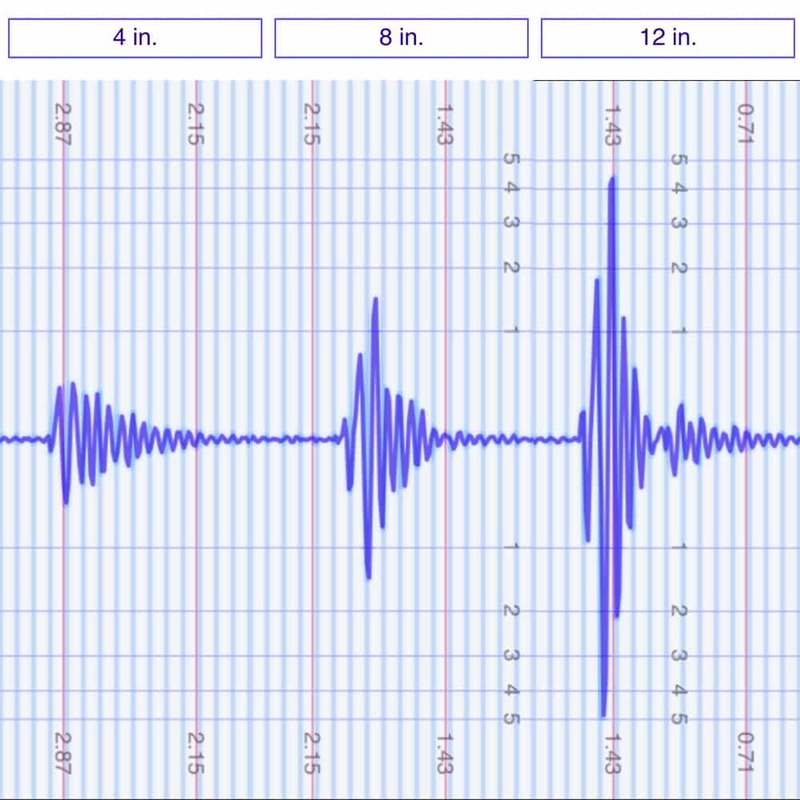 This test is to simulate someone getting into and out of bed or tossing and turning at night, and it’s helpful in showing the intensity of motion that is detectable from one side of the mattress to the other. For the motion transfer test, I dropped a 10-pound steel ball from heights of 4 inches, 8 inches, and 12 inches and measured the disturbance on the other side of the mattress. This should be pretty intuitive: The bigger the lines, the bigger the disturbance. I found that the Leesa performed well in the motion transfer test, doing a good job of dampening the disturbance from the 4-inch drop. The 8-inch drop simulates someone getting into bed, and the combination of avena and memory foam layers keeps the motion transfer to a low level. Finally, the 12-inch drop is to simulate a child or pet jumping into the bed, and we see a larger spike here as the ball begins to interact with the denser base foam level. Many people buying a mattress will want to understand how far into it they will sink. In order to get a better idea of how much sinkage someone can expect to experience on a Leesa, I use four balls of varying sizes, weights, and densities (a 6-pound medicine ball, a 10-pound steel ball, a 50-pound medicine ball, and a 100-pound medicine ball) and place them on the mattress to measure how much they compress the surface. These different sizes, weights, and densities help to imitate different body parts or different-sized people to show how far into a mattress you may sink. 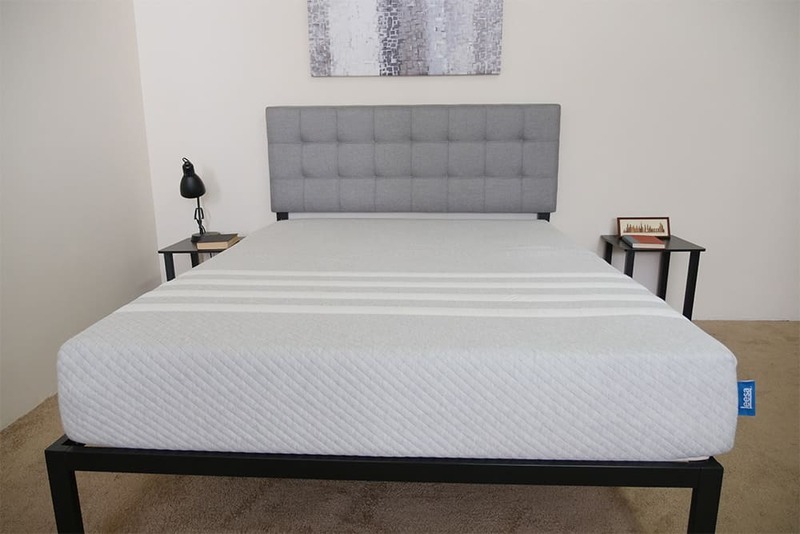 If you are going to share your bed with a partner and need to use the entire surface area of the mattress, then edge support is something you are going to want to look at. Foam mattresses sometimes struggle to live up to the edge support of traditional innerspring mattresses, so I wanted to take a closer look at how I would feel near the side of the Leesa. When lying on my back near the side of the Leesa, I felt secure and well-supported. While hanging off the side, I did see a little bit of compression through the comfort layers, but that is pretty common. Even when changing positions, I wasn’t worried about rolling out of bed. This position is meant to simulate putting your shoes on in the morning or getting into bed at night and has all of my weight concentrated over one area. There is a bit of compression, as is common with a foam mattress, but nothing I wasn’t expecting to see when I sat down. This may not be the most important position for you when purchasing a mattress, but it does a good job of showing how the edge will respond when weight is directly applied. Sleep Trial: Leesa offers a 100-night trial period. Warranty: The mattress has a 10-year warranty. Shipping: Leesa ships the mattress free to your door, and it will arrive compressed in a box. I would also like to point out Leesa’s amazing giving program. For every ten mattresses sold, the company donates one to those in need. Along with that, they also partner with the Arbor Day Foundation to plant one tree for every mattress sold. Not all companies are this generous, and I find this type of commitment to charity admirable. If you like the idea of of purchasing from a company that gives back to the community, then Leesa deserves your attention. Confident the Leesa is the right mattress for you? Now that we’ve seen what makes up the Leesa and put it through some tests, it’s time to discuss who I think it would be a good fit for. In short, Leesa mattresses are good for back and stomach sleepers, those who value breathability, and restless sleepers. Back and stomach sleepers: When I was positioned lying on my back, I felt that the Leesa did a good job of keeping my spine aligned so I wouldn’t wake up with aches or pains in my lower back. Change positions while sleeping: For those who move around in the middle of the night, the bounciness of the top layer of Avena foam on the Leesa does a good job of allowing you to adjust your position without interference. Breathability: If you’re worried about sleeping too hot, the comfort layer of the Leesa is made of a latex-like foam with holes in the top and a convoluted design to allow airflow through the mattress. 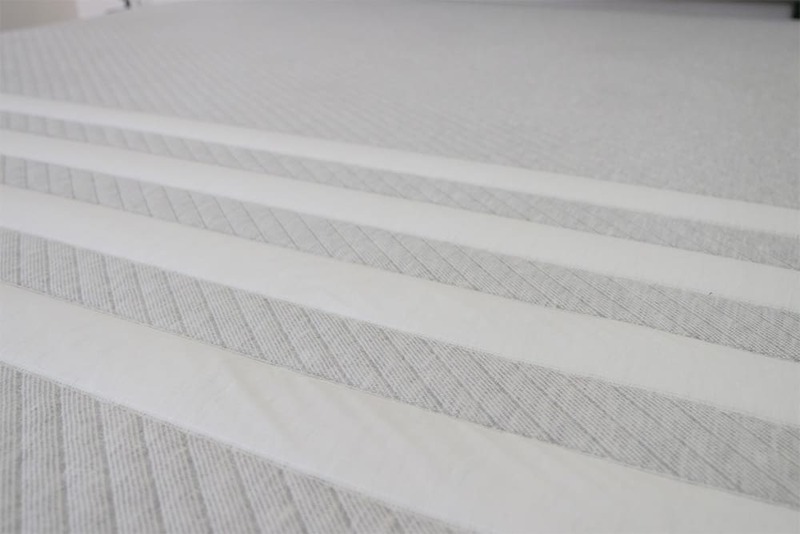 This, combined with the breathable cover, provide some cooling and temperature regulation to the mattress. Balanced foam feel: As I mentioned before, the Leesa has good bounce to it thanks to the top layer of Avena foam. By placing the memory foam beneath the latex-like top, the Leesa also provides pressure relief for those who dig a bit further into the mattress. This combination of bounce and pressure relief provide a balanced general foam feel. Ready to order your Leesa? Use this link to grab our discount link and save $130 instantly on any Leesa mattress!